1963 dated, US Navy, WAVE, Woman's Service Dress Uniform, belonging to Lieutenant Commander "E. Lindgren"
This uniform is dated on the tag found inside at 1963 while the issue tag is dated 1964. 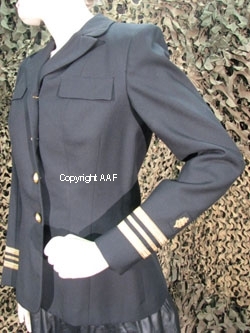 It is a US Navy, WAVE, Woman's, Service Dress Uniform. This uniform is custom tailored. It has a name tag sewn inside with the name of "E. Lindgren." Also sewn inside of the jacket are the "E.L." initials on a custom made tag. Ms. Lindgren wears on each sleeve the beautiful, heavy gold bullion insignia of a Lieutenant Commander which is similar to an Army Major's rank grade. Ms. Lindgren's serial Number of "7662" is also typed on her name tag. The jacket is not size marked, but appears to be about a size medium for the time period in quesiton. The condition is MINT! 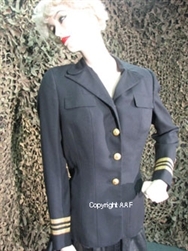 Vietnam conflict period uniforms are increasing in popularity and price each day. Female uniforms it should be noted are much more rare than most male types. This beautiful black uniform is impossible to improve upon. It's provenance is documented by it's accurate tag dating. The fact that it is also named and serial numbered inside make this uniform a great find, and both easy to research. What a wonderful project it would be to trace the history of this very high ranking WAVE Woman Officer. An experienced and knowledgable uniform collector would know the importance and value of this uniform's dating, condition, rank grade, and female classification. Here is a chance to own a great uniform at a less than market price!